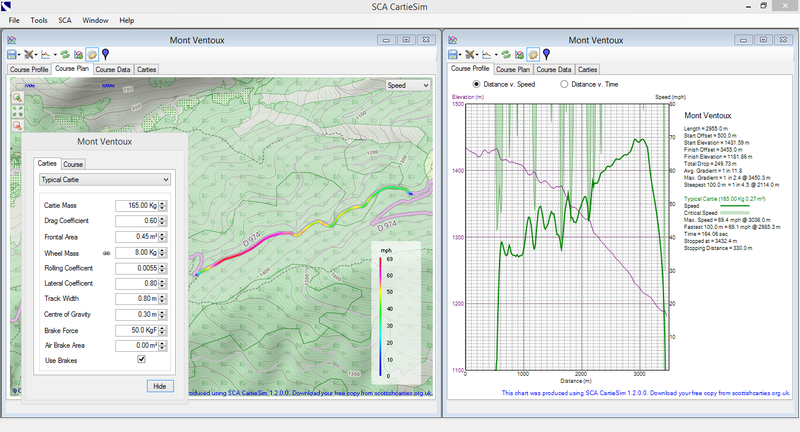 SCA CartieSim has been developed by the Scottish Cartie Association as a tool for cartie racers and race organisers. It allows cartie courses to be analysed to predict likely speeds and course times. In addition, it can highlight sections of the track where high speeds and tight cornering may cause difficulties and can be used to model the effect of chicanes on speeds. Data can be loaded from Google Maps, GPS / SatNav data files and files created by Trackmaster, and the characteristics of individual carties entered to predict the effect of changes to weight, aerodynamics, etc. Calculates course data such as total length, average gradient, maximum gradient, optimum speed trap location, etc. SCA CartieSim can be downloaded for free. 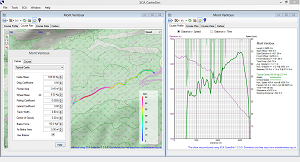 All the features work fully and are not time limited, but the main chart is watermarked and you cannot export the chart or the course map. A license costs just £30, and all proceeds go to help the Scottish Cartie Association promote and run cartie races. Disclaimer: SCA CartieSim provided 'as is' without warranty of any kind, either express or implied, including, but not limited to, the implied warranties of fitness for a purpose, or the warranty of non-infringement. Submitted by scottishcarties on February 1, 2012 - 09:51.